This exciting and ambitious project spans 135 miles of Kent’s coastline from Dartford to Deal, and focuses on restoring and creating habitat for Kent’s wild bees, especially the Shrill carder bee (Bombus sylvarum). 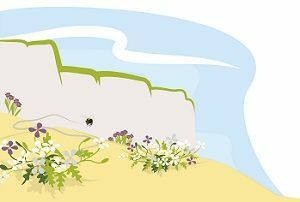 One of the primary aims of Making a Buzz for the Coast will be to safeguard rare bee populations by creating and restoring habitat and linking isolated populations together through the creation of flower-rich ‘stepping stones’ and habitat along the coast. Habitat and bee surveys will be an essential part of the project to help us build better data, evaluate our activities and monitor bee populations around the coast. We know that to really have an impact and make a difference for all our wild bees around the coast we’re going to need as much help as possible. We will be touring the coast with a programme of events, activities, competitions and training to raise awareness about the importance of bees to Kent, build pride in the rare species that live right on peoples’ doorsteps and most importantly of all, inspire people to take some action to help. In June this year, the project held a celebration event at Hempstead House attended by local town mayors, partners, supporters and press. 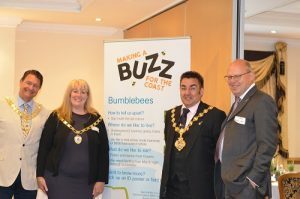 It was a celebration of achievements to date and the next steps, with an aim to safeguard the UK’s rare bee populations in Kent. We are delighted to announce the winner of our photography competition is Emma Smith. You can read more here and view her winning image. You can also view the 11 shortlisted photos here. If you missed our competition, you can read about it here and we hope to do another one in the future. The project will work with the RSPB, Thanet District Council and Thames Water on five sites to provide habitat for rare bumblebees and solitary bees. In addition, we will be working with Kent Wildlife Trust in Swale to improve roadside verges for pollinators, creating ‘Bee-roads’ and increasing habitat connectivity. Another key element of the project is supporting landowners, ranging from farmers and fruit producers to holiday parks, golf courses, small holders and large estates. We will provide free and bespoke information and advice on restoring and creating pollinator habitat. Monitoring bumblebee populations and their habitat is essential. It provides the data needed to determine where best to put our efforts and to inform the land management advice we give. We are training and supporting people to carry out bumblebee surveys in their local areas as part of the Bumblebee Conservation Trust’s national recording scheme BeeWalk. To help us monitor our rare bumblebees, such as the Shrill carder bee, we are providing training to help you spot them and would encourage people to get in touch with any sightings. The impact of our project will be greatly increased with help from local communities. We are touring the coast with a packed schedule of events, activities, competitions and free training courses. Through sharing knowledge we hope to raise awareness about the importance of bees and pollination in Kent, build pride in the rare species present and most importantly of all, inspire people to take some action to help. Planting pollen and nectar rich wildflowers in your garden could provide a valuable food source for bumblebees. We are teaming up with Kent Wildlife Trust to award the Garden with the Best Buzz category as a part of their Wild About Gardens competition. You can find out how bee friendly your garden by visiting the Bee Kind section of the website. Kent Wildlife Trust, Kent County Council, Natural England, RSPB, Swale Borough Council, Thanet District Council, Thames Water. 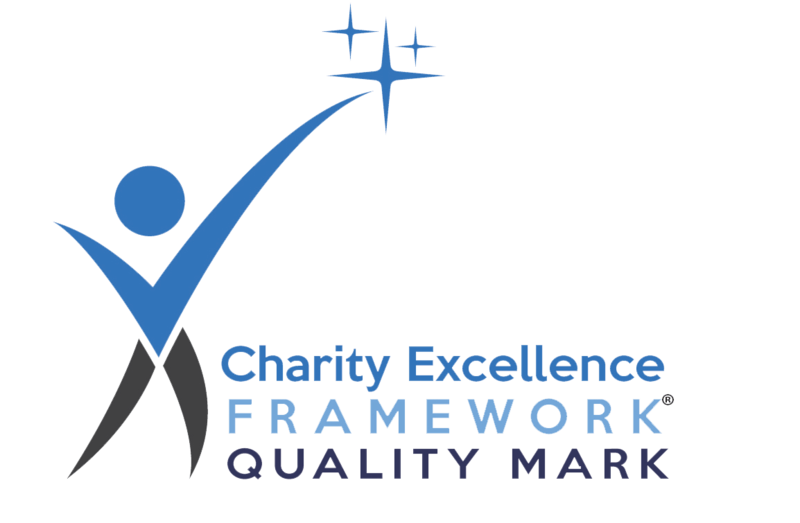 Chapman Charitable Trust, Clark Bradbury Charitable Trust, Dulverton Trust, John Ellerman Foundation, Kent County Council, Macintosh Foundation, R G Hills Charitable Trust, Schroder Charity Trust, Thames Water, and all those individual donors who supported our 2016 summer fundraising appeal for this project.